Mackey, Rao Gupta, Prahalad, Lazarus and Gates gather, from left to right, for TIME's panel on creative capitalism. TIME Managing Editor Rick Stengel recently convened an elite panel of business leaders and thinkers to talk about how corporations can do well by doing good. The panelists were Microsoft co-founder Bill Gates; Whole Foods founder and CEO John Mackey; Ogilvy & Mather chairman Shelly Lazarus; University of Michigan professor C.K. 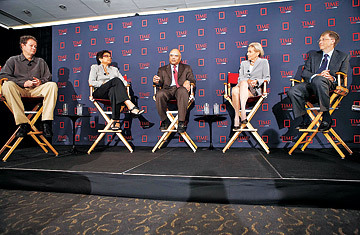 Prahalad, author of The Fortune at the Bottom of the Pyramid; and Geeta Rao Gupta , president of the International Center for Research on Women. Here is a transcript of the wide-ranging discussion. Stengel: Bill, what is creative capitalism? Bill Gates: Well the starting point is that capitalism has done a great job. The life expectancy has more than doubled in the last century. The number of people who are literate and, pursuing economic opportunity is just dramatically higher over a long period of time. But if we look at it and say, how are we doing for the people who are the worst off, the poorest, we see that the rate of improvement for them is nowhere near what it should be or that it could be. And we see in the roles of the different actors, government and business, an opportunity to change that. In the case of business, they have a lot of innovators. Now, let's just take the drug companies, they, they understand about creating new drugs and testing new drugs. That's a very deep competence that government does not have. Only business. And appropriately, those drug companies respond to market signals. And so there are market signals, say from the rich world, that things like male baldness is a serious issue, and so resources are put into that. There are some other issues, diseases of the poorest, that there is no economic signal that's saying the innovators should be put to those problems. And so some combination of forces, either the corporation itself, wanting to make a contribution that helps it in terms of its image, its hiring, its relationship with the government, or, some dollars that come in that create a market for that goods, in some way we need to draw that innovation power to do work for the poorest. In some cases it's very straightforward, you can have tiered pricing, if there's a market for a product in the rich world and in the developing world then it has a low marginal cost for production, then you can have the best of both worlds. You can recover most your R&D off of those who are better off, and you can have close to marginal cost pricing for those who are the poorest. Now doing that differentiation so it gets to the appropriate people is often a challenge but there are cases that that is being done. I think now more than ever, as the state of science lets us be very optimistic about breakthroughs, that we have engineers, not just in the United States but throughout the world, particularly in Asia more and more, that we get the, the goal line, the measurement of what corporations do to also include this idea of, have you made a special effort for the poorest and the most needy, that will be important. I certainly know as I come to my full-time work at the foundation, I'll be going to cell phone companies and saying, hey, can we have free air time for these healthcare clinics to call up and get advice about medical things. Can we have a special way of using SMS messages so that farmers know future weather conditions and pricing things and so even a very small-scale farmer is armed with the information he needs to make a decisions. I'll be reaching out to banks, because there are new ideas about how we can have not just microfinance with loans, but also savings and insurance type things. And so, the progress of many of the things that the foundation is working on will depend on these corporations making a decision that in the short-run is not purely profit-driven, that is, being willing to try some novel things and put some of their smartest people on it in an expectation that either inventing new products will create economic opportunity, which is really C.K. 's idea that was very stimulating to me when he first came out with that. Or, in addition, that's just in terms of reputation for hiring employees or working with governments that there would be a benefit for having done this type of project. So, I think the generation of young people now are particularly interested in these things, I certainly get asked a lot about you know, how they should see their energies not just being taking the best paying job but also being associated in their work, in their giving, or in their voting, with the needs of the poorest. Stengel: C.K., I know that Bill was influenced by, by your work, and one of the questions I have, and I guess it's a question both about creative capitalism and how you see it, is that, when it comes to cell phones for Kenyan farmers for example, isn't this just good old fashion capitalism in the sense that it's a recognition of a market that people hadn't figured out how to profit from, and now, and now they are. Prahalad: I think it is, but there's a twist to it, and I think it's an important twist. If you look at traditionally how we have looked at all this product and services especially high-tech products like cell phones, we would never have gone to the poor. But, I think that growth opportunity is there, as the cell phones have demonstrated. Also, it is changing the asymmetry of information, be it the farmer, who can now get prices, weather conditions, or someone who can make small transactions with SMS messaging, suddenly the asymmetry of information which is the essence of poverty  that is why people are poor, they don't have access to information  that is changing very, very dramatically. What is happening in the cell phone industry, three billion people are connected for the first time in human history, I think it will be four billion soon. That I think gives me tremendous confidence that we can really take Bill's idea and see it through to its logical conclusion, which, for me, is how to democratize commerce. So that the challenge for the 21st century for me is: how to make every human being get access to world- class products at affordable prices. A good example is the cell phone. That means we have to change the business models as well as the technology. And the second is how to make everyone a micro-producer. So, to me if you can create the capacity for consumption, and capacity for getting paid for your effort, we will have created a fundamentally different world where inequalities, and not only just income inequalities but opportunity inequalities and lifestyle inequalities will have changed. So I start with the proposition that it is in the interest of the large company both local and global, to focus on the poor, because they provide a fundamental and new source of innovation. Bill already talked about in his paper a 50 cent vaccine for malaria, a one dollar serum, or vaccine, for cholera, that is only possible if you want to go to the bottom of the pyramid and take care of those people. I think that they inform the developed world on how to create fundamental innovations. Thirty dollar cell phones, $30 cataract surgery, less than a cent for a minute of cell phone time, a one cent sachet of shampoo  these are fundamental innovations. They are not necessarily technological innovations. They are new business innovations that have been transforming most of Asia and a lot of Africa. We tend to forget, even in Africa which is the poster child for problems and opportunities, Celtel and MTN are two of the fastest-growing local companies. People find a way to buy cell phones and use these because it improves their lives. So, I believe that the obligation to participate and to use the term that we use  do well and do good  goes beyond just being nice. It's really starting to see a different pattern of opportunities. And I believe that companies are really starting to see a new pattern of opportunity. And that is why it is so exciting, because it is really re-thinking the role of capitalism, call it creative capitalism, by taking the energy, the technology, and the organization, deep down, so that we innovate continuously, and I think that's the exciting part. Stengel: Now, Geeta, there are lots of women at the bottom of the pyramid. In fact, C.K. has written about how the use of microfinance, how women have disproportionately used it, and succeeded although not grown their businesses to the extent that others have. How do you see creative capitalism helping women, in particular, in the developing world. Gupta: Well, microfinance is, actually, one of the best examples of one type of creative capitalism, and it's a shade removed from the one which C.K. just described, which is you know, doing well by doing good. The model that microfinance operates on is more what I would call development entrepreneurship, where solving the problems of poverty are the central mission, not making a profit. But that you use market principles in order to be able to make a difference in that sphere and the best examples of microfinance, I mean the Grameen Bank is the most famous example but there are now hundreds of those kinds of organizations all over South Asia in particular and all over Africa that yes, reach out to women. Ninety percent of all borrowers are poor women. And they have developed a model whereby they can actually sustain their microfinance services by actually charging a larger interest, by, you know, charging some sort of pricing, it's difficult, and, but also, depending on some grants in order for it to work because in order for microfinance to work, you need communities that have some financial literacy, you need to be able to invest in their human capital a little bit in order for them to truly benefit from the financial services. So, to what Bill said, you know, there's is a third partner here. There's the government, there's business, and there's civil society, and I represent a non-profit organization and I can tell you, that some of the most exciting partnerships are when those three come together to make a scaleable difference in the lives of people. Stengel: Now John, Geeta mentioned the role of government, the role of non-profits, and we were talking a little bit before, I mean you are a, in some ways, a pure libertarian and don't really see government as having much of a role in, in helping folks, and that the corporation, and companies like yours can actually do well by doing good both by serving its own constituency, it's customers, and the consumers. I mean, so, how do you see creative capitalism, and I know you call it something, conscious capitalism, what's the difference between the two? Mackey: Well, I think creative capitalism and conscious capitalism are fellow travelers, they have much more in common than they have differences. I'd define conscious capitalism in terms of two things. First, that business become conscious, or becomes aware that it has a deeper purpose. We tend to think of the purpose of business to maximize profits and shareholder value, and I submit that that's mostly a myth. That's not, most entrepreneurs do not start their businesses in order to maximize profits. Having read about Bill, he had passion for software. He wanted to put computers everywhere, he wanted to transform the world. That's, that was passion, that's not about maximizing profits, it worked pretty well  he became the richest guy in the world. That's a nice consequence of having a deeper purpose. But Microsoft is one of the world's transforming organizations, and I might add, so is the Gates Foundation. Because it has a deeper purpose. So the first part of conscious capitalism is becoming aware of the potential that every business has to pursue a deeper purpose. And secondly, is understanding that in the 21st century, we live in a world where the best way to optimize, or the best way to maximize profits or shareholder value is not to aim directly for it but is an indirect result A. of purpose, B. of what you want to say, the interdependent nature of stakeholders, that the customers, the employees, the investors, and the suppliers, the community and the environment, are all interdependent and connected with each other. There's been far too much attention paid to the conflict of interest of these stakeholders, and not enough attention paid to the fact that they're all connected to each other. So, the 21st century conscious business is trying to optimize the business system. If you optimize the business system, and seek the win-win-win-win solutions, which I think is something creative capitalism is built to advocate, you will also happily maximize your holder value in the long run as well, and you'll maximize the value for your customers, for employees, for suppliers, and for communities, so those are the two aspects of conscious capitalism. Deeper purpose, interdependent nature of the stakeholder base. Stengel: Shelly, I'd love to, for you to jump on that, and I have a sort of two-part question for you. One is a very practical one, I mean, we're living right now at a moment where most consumers perceive the regular good-old-fashioned economy as really struggling, and they're, they're grappling with their mortgages, and four dollar gas, I mean, how will people receive this idea of creative capitalism. And the second thing that I want you to jump off on, and then I want to go back to Bill, is, you know one of the notions, Bill's notion, and John was just talking about it too, that the recognition that companies get for doing good actually has all kinds of benefits that ultimately go to the bottom line, not the least of which is the fact that it attracts people, and young people, who say, hey, I'm proud to work here because of the things this company is doing. Lazarus: Well I think it, what's so interesting, is that people are still debating whether companies should have a conscience or whether corporate social responsibility is essential to creating shareholder value. And yet all these same companies say they're market-driven. Well, the market has spoken. Consumers care. They care. And whether or not you tell them what you're doing, they think they know. So, part of anybody's brand has to do with what consumers impute to that organization in terms of how much they care, their citizenship, whether they have a conscience. And so I think it's now become obvious, the debate is over. Consumers care and you have to worry about it. And the second thing I would observe is that in companies that have really strong brands, the whole, you don't know where the sort of commercial part ends and the conscience, giving part begins. In the best companies it all sort of flows together and it comes together and is represented in, in what that company stands for. We do advertising, we do the brand campaign for Dove. And peop  women around the world, they don't think it's advertising at all, they actually think it is "Thank you, for bringing the issue of how people perceive women in the world, to women." And so, we actually won an award last year, we won the big prize at Cannes last year, for Dove. And the big debate was not, whether it was the best film, everybody thought it was the best film. The debate was, was it advertising? Because it actually was about creating a movement, for self-esteem for women around the world. And so, I think so the whole, all the lines are diluting you know, they're sort of, everything is morphing and everything communicates. And one of the things that communicates most strongly right now, I would say, is the conscience of organizations. Stengel: Bill, I'd love you to talk a little more about that because you write and speak eloquently about how recognition does help corporations, and we're all in the business of trying to attract the best talent. Is that the only side benefit of it? Are there other economic benefits to it? Gates: Well certainly the response that we get as a foundation when we go into corporations and say, hey, you can do a project, you can help us fortify foods with more vitamins, you can help us build more bed nets for Africa using a technology you have that's unrelated to that. The reception generally is quite positive for those things. And, it really must be that those business people see that their employees, their regulators and their customers want them to behave in a particular way. Now, to really bring this to its highest level though, you want more visibility, you want almost a competition in how people are doing these things. You know, in towns you often have the law firms will be ranked according to the pro-bono work they do, and that's a very positive thing, somebody who's not at the top of that list says, should we do more pro-bono work. Recently, and I mention it in the time article, there was a ranking done of pharmaceutical companies, and that's very, that's very important. I mean, if I had to take one industry who just doubling their creativity of capitalism can make a huge difference and save millions of lives, it's the pharmaceutical companies. And it's unfortunate that in some sectors they're not viewed as these great innovators sort of doing wonderful things. They are wonderful companies, but I think they, they'll get that across better by heightening their participation in things that have a particular impact on the poor whether it's tiered pricing, or R&D into the diseases that only go on there. So yes, I think it's a  would be a smart decision for them, to look at that ranking table and consider concretely how they can do more. And often, it isn't that high a percentage of your innovators that you need to get focused on this, in fact it's kind of a good rotation for those innovators to go off and look at doing something for a super-low price, or doing it in an area where there's no electricity, or clean water, you know, it may make them think of something that actually is applicable to the entire marketplace. Stengel: And pharma is a, is a, let's dwell on it for a little bit because it does have a disproportionate influence in terms of the kinds of things that you're doing. But some of the critics of creative capitalism would say, well, the marginal cost of production in pharmaceuticals is actually quite high, so why, we want to spend money on wouldn't we want to spend money on products that can bring us the most economic benefit, you know, for reducing cholesterol and that kind of thing. I mean, is there, what is the economic model, C.K., for pharmaceuticals to say, ok, let's create a better malaria drug, or let's create a product that really only helps people at the bottom of the pyramid who suffer from these diseases. Prahalad: I think the traditional pharma model of only blockbuster drugs, meaning, three, four billion dollar drugs that only takes care of problems of the developed countries, and typically the U.S. market, the most lucrative market  there are price controls even in Europe and Japan  the blockbuster model is getting out of fashion. If you look at the pipeline of the most companies, that's not where the action is. So the entire big pharma model is open to question. So the new economics of the pharma industry is going to be, how do we pick drugs which will have two hundred, three hundred, five hundred million dollar opportunities, and how to dramatically reduce the cost of development so that we can make money marketing these. So what is happening? A lot of the manufacturing of pharma is going to countries like India and China. A lot of the clinical trials are going back to India and China. A lot of the research, contract research, is going to India. And what essentially is happening is the pharma industry is morphing, like the computer industry did. If you go back to old IBM model, 360, it was fragmented by folks like Bill and Intel. They took the vertically integrated stack and they created horizontal stacks, like Intel, and Windows, and so on. Then it morphed again to a public infrastructure, which may be a commodity, but the applications are not. Now it's at the full stage of evolution, where the Indian software industry has become a credible partner in building new applications and remote maintenance systems and so on. The pharma industry is still in the old IBM 360 model: vertically integrated, very high costs, very oriented towards a certain kind of markets. I believe that mission-critical as pharma is, I would argue computing is as mission-critical. None of us would want to have a few transactions missed in the world of financial markets. So it is a mission-critical application. So, I think it would be useful to go back to the computer industry and its evolution over the last 20 years and ask the question, if pharma is at the early stage of its evolution, is they focus on what they call orphan drugs which are not exploited even that affect people across the world who may not pay as much, are they going to become very successful, if we do it with partnership with companies, let's say in India or China. Stengel: But are there, and I guess, Shelley and John, you would have an opinion on this, are there some benefits from a consumer perspective in this sense, that let's say, say 'You know, I'm going to buy that pain reliever, because I know this is the same company that is also producing drugs that help people in Africa.' I mean is there some, is there some aura? Lazarus: I mean, you know, it's sort of, it's sort of, you've got to create the aura. And with full disclosure I sit on the board of Merck. I was just at a board meeting yesterday afternoon actually. And they know that to the extent that consumers know that they do things in poor countries or help people who can't afford drugs. Actually they think more of Merck. It has a direct impact. That, the issue that I think the pharmaceutical industry has, I think is, that the cause, the, the general impression, that the public has about them, is that they are all about profit, and they don't care. It's hard for the public to hear that they're doing good things. And so it's a bit of a dilemma they have, because they are doing some, some things where they, they give away vaccines and drugs and all that. But they're not getting a lot of credit for it, and and very often, when companies get credit for something, it sort of reinforces the behavior and they do more of it. So I think we've got to figure that out. But we do know that, that once people know that these companies are doing things to help poor people. It does enhance the brand of the company. Gupta: ... where they stand ... right. Gupta: So it's both a carrot and a stick, and I think that the way that pharma has changed its priorities in recent years has been largely because of civil society activism. Where they have been, you know, asked to do better on that front and now the perception, and I absolutely agree with Shelley, is, they want to be perceived better, and they realize if they, if they think of you as, um, to provide their product to, um for the communities, for diseases in the developing world, that it will improve their whole corporation. That does have an impact on the poverty line. Stengel: John, you already have a good corporate image. And one of the things that I think that even CK has written about, is that consumers are willing to actually pay a little more for a product if they are told that some percentage of the profits are going to something that's philanthropic. I mean, does that effect your model in any way, I mean I think people go to Whole Foods because they think it's a good and positive experience, and it's not necessarily a philanthropic one. I mean, they want to eat something that tastes good, and it's healthy. Mackey: So I'm not quite sure about what your question is. Stengel: Ok well, you don't, they shop at Whole Foods without feeling like there is some, some other extrinsic benefit. It's like, it's a benefit for themselves. Right? Mackey: Before I answer that, I want to get my way in on the pharma question. First we've got to understand, it costs about a billion dollars to get a drug through the FDA. So one of the reasons why, they're orientated towards this "blockbuster model" is because that's the only way they can get a return on their invested capital. It's not easy to get a drug through the FDA. So we could look at some de-regulation there, or one of the reasons it is being outsourced to other countries that they can't, the drugs not going to be a blockbuster, maybe it's a drug that shouldn't be going through the FDA because it's not going to get through or its going to be too expensive to get through and get a return, so they outsource it to places that don't have the sort of stringent requirements to get approved, so that's one issue there. And regarding what Shelley was saying, I don't think, and it's sort of reference to Bill as well, the whole corporate social responsibility is trying to graft something onto an old model. It's still the same profits and maximization model, but lets graft on some good public relations, because we've got these activists out there hassling us. What we need is a transformation. The way we think about business, what it's based on, people want businesses to do good in the world. It's that simple. And they want pharmaceuticals companies to do good in the world, and pharmaceutical companies are doing good in the world. So, if they just change the way they think about themselves, and though, the production of drugs, the bills coming forth, should be absolutely the core part of their mission. It should be something they do, just as long as, along with everything else they're doing to produce drugs for the rich part of the world, that should be part of their mission statement. And I think just grafting on certain PR stuff, is not going to, to over the long term do the trick. We need a more deep, fundamental reform in the essence of business. Prahalad: I think CSR as a response, it's at best a transition stage for a company. That's where you learn that there is more to business than just profit maximization. So I look at CSR as a transition phase. The real stage of development is when this becomes the mission of the company that dealing with the impoverished in the world, is not something you do once in a while. I say it's not giving away drugs free, that is better than not doing it, but it's not a sustainable model. The sustainable model is where the activity must be a part of your business. That means we have to not only have to think differently about the purpose of the business. I think this is going to require a tremendous commitment to innovation, and the use of technology in ways that we have never looked at before. And, you know, the amazing thing for me is when I look around at all the cases where things are happening to do this  it's all about innovation. But it's not just about technology and innovation. It's about business model innovation. And I fully agree with Bill, this is not about taking five thousand oddity folks in the other direction. It requires very small teams. In my experience, I find, you give me 15 dedicated young people, and they can go make a difference. Build a different business model. And, so, I think in the start of our change, in a way, it is not that we totally redirect all our resources. No. It is understanding how to get small groups of people who have connections with the body politic of the organization and letting them loose in these markets. Let them start with a clean sheet of paper. Figure out how to distribute drugs well and without much refrigeration safely in Africa. And I ca tell you that often these small teams come back with amazing ideas. .
Stengel: Oh and Bill you talk about sustainability in your piece. I would love you to elaborate on that. Because it's not, as CK said, it's not about putting a band-aid on a problem. It's about re-conceiving a problem, and figuring out a model that is economically beneficial and beneficial in the larger sense as well. How will that work? Gates: Well I think each industry will have its own norms and regular reviews of both, what they're doing to help the poorest, and how innovative they are being on behalf of the poorest. Just getting the company to think about why things are tougher for those consumer or what the price points are, just getting that awareness, that I think is going to be very, very helpful. And, we don't even have to ask how much of that is driven by the fact, that they think they can do profitable products down there and how much of it is driven by their desire to be a responsible actor, and and see more people benefit from their products. Because that's what they're good at doing. But, you know, my dream in this is that industry by industry we could all say ok let's go look at the report, and in the same way that for countries today there are people who look at freedom and corruption and those are largely well done, and they do have an influence. Countries look at that, businesses look at that and it creates the right type of feedback if for business we have good ways of doing this we can take even complex businesses like banks or food companies or cell phone companies or technology companies and say what were the smart ideas, and drive everybody up to a higher level that means the bottom of the pyramid is something that they're engaged with. Stengel: Now you talk about, and I'm going to kind of simplify it, that in effect for creative capitalism there is a three-legged stool. There is corporations in the private sphere, there is NGOs, and there are governments. Everybody has to work together in a sort of complex way. How, if you could define that, how, how would you define it, and I think lets talk about that, because I think that there's some difference of opinion in the role the government should play in all of this. Gates: Well take a very complicated problem, like delivering a malaria vaccine, that's a case where the cost of doing it is so high that the company itself can't just decide to do that, what they can decide to do, is to be willing to do that work essentially on a break-even basis for the poor, and money comes from the government or philanthropy to them, and they put their best people on it. So huge opportunity cost, they go and do that work, and so government and philanthropy had to initiate it, and the pharma company had to put their top people on it and then when it comes to distribution it's NGOs that have women in the villages that are out there thinking about the health care needs. They're actually the back bone of the real impact that gets delivered and used in the right way. So only by bringing those three elements together and taking the strength of each one can you imagine, which very optimistic, we will have in this next decade huge breakthrough in that, disease. Stengel: Now, John, I know that you're a skeptic about what role the government can or should play in all of this, I mean, can it be done without government help? Mackey: It depends on what you think the role of government is. I mean there's, we know how to end poverty, poverty ends with economic freedom. All the countries that are rich have high degrees of economic freedom, all the poor countries have low degrees of economic freedom. It is a direct correlation. And the countries that don't have economic freedom, that's mostly due to government. Government, government rules, monopolization, not all, there's great studies about how long it takes countries to set up a legitimate business. One that's not off the grid and underground, and countries that don't have a high degree of economic freedom, it takes over a year just to set up a simple business like a barber shop if you need to get permission from the government to do it. So, government is an enabler by removing the blocks of economic freedom, and in protecting property rights and having rule of law, making sure that we have ways to mediate contract disputes, having a good judicial system government has a very important role to play. And it, but it's not an engine that is going to end poverty. That's going to be entrepreneurs that are going to end poverty, not entrepreneurs primarily from the rich world, it's going to be entrepreneurs in poor nations that are going to be liberated to be able to create businesses and to create jobs and transform their countries, just like we're seeing happen in India and China, where we had economic freedom increase in the last 20 years, and we've had hundreds of millions of people escape from poverty. That solution will work, not just in India and China, it will work all over the world. Stengel: Do you see that happening Geeta? Gupta: Yeah, a lot of the entrepreneurship happens within the non-profit sector, among NGOs. And I often say that NGOs are the incubators for new innovative ideas. That then corporations can take to scale and governments can take to scale. So I think that you know NGOs provide a lot of equity. They provide the access to communities, the distribution and access issues are typically addressed by NGOs who understand the realities of the ground and the barriers that communities face in accessing commodities. So, I think it is a three-way partnership. I think that you're right that governments have to create the enabling environment for all of this to work, and if these three partners come together well you can see incredible results. Stengel: Is there, shall I wonder, I mean, government is a brand too. I mean..
Lazarus: Obviously in need of some help. Stengel: But maybe, isn't this maybe a way to help. Bill was talking about governments being rated for the good things they do. Lazarus: Maybe if they could ever get it together and figure it out, but actually as I was listening to him, what I was thinking was, you know, if somebody's got a leak, one of the issues I see is, as I watch companies that are trying to reinvent themselves and do things, it's whose going to lead. I mean the pharmaceutical companies might want to have a new model and make drugs available, but I think absent the Gates Foundation, Bill, they don't quite know how to do it themselves. That's not what they do, and I'm not quite sure that government can do it either. So, I mean, does that, is that, are, you know, the NGOs actually, is that what the role is? Gupta: You know I have to say to that are world has changed enormously, and we've been around for three decades now and it's only in the past five years that we've had private sector companies coming to us and say we want to do things differently, we have a new model, and we want to think about, can you help us, can you partner with us? One of the best examples, and the most recent one is with Goldman Sachs investing 100 million dollars in business management training for under served women in the developing world, which is to be applauded, because you know when you ask Lloyd Blankfein why did he come up with that, because that was my first question to him in the press conference. Why did he think this was a good investment, he said for so long Goldman Sachs has been in a way chasing GDP, going to countries where there is potential for growth, we'd now like to generate it and we recognize that investing in women is the way to do that. I think that's brilliant, and now they need the right partners in the countries in which they are working to ensure that they can, in fact, get the under served women, because there is an access issue there and that those women have the ability to overcome some of the cultural barriers that exist for mobility and others, and to be able to take advantage of this opportunity. That's the NGO-Goldman Sachs partnership that's going to have to occur in each country for this program to succeed. Stengel: I'm going to call an audible here. I know that we decided that we weren't going to have questions from the audience but I'm curious about people, about whether I'm asking the right questions. And if there are things on people's minds that they would like to ask Bill or any of the panelist, so raise your hand if you have a question. Yes, ok, Billy. Billy: Shelly, you talked about companies, people buying, and going to use their products, but Wal-Mart does not provide health benefits to their employees. Do you think people go to that store and think about that, or do they just go because they have a good pricing and they can buy their products cheaper. Lazarus: Well I actually know a bit about that. Actually people know, know about Wal-Mart. Surprisingly, about their labor practices, because I've been to some focus groups where people start to talk about some of the good things that Wal-Mart does, all the green initiatives, for instance. And people in the focus groups go, "aren't those the people that lock people in the stores at night?' So people know. So the thing is, once you have a negative image it's really hard to start talking about individual things that you do quite well, cause people have trouble accepting that. But having said that, there are some things that overwhelm, I would argue, the good deeds that, or the lack of good deeds that some companies have. And low prices are to some people irresistible. There is also a sense though, and I have seen this in research that there are people who are troubled by, they go to Wal-Mart despite what they know are Wal-Mart's labor practices. And so, it's always, there are different motivations that drive people to consider behavior, but the thing that I, that I can say with certainty is that people are very well aware of what Wal-Mart's practices are. Gates: Well, within the technology sector, Microsoft has done a lot to be a good example of giving the software away for educational use, for community centers in these countries, getting the software out in libraries. So, Microsoft is going to have to stand on it own in terms of it's image and the good things it does. I think it measures up quite well in that respect. You know, the foundation is a separate activity, we have our own reputation to make sure that we're doing things well. There have been common projects, the putting computers in libraries being one, things that help out in refugee situations has been another, but you know if there's a Microsoft group that I've actually learned a lot from it's our lab in India, where they go out and look at, what would the poorest do with technology. And some of what's come out of that has been amazing, we're actually, instead of trying to use PCs and Broadband, we're using DVDs where we get those out and have farmers see other farmers doing things the best way. We actually have a contest that the farmers love to compete in, and if you're the best it's put on DVD and taken out to other people. So that kind of research, in that kind of country where the need is and being honest about, you know, once the press conference is done, will this really end up being used in a sustainable way, and each company has to do that concretely. And I think a number of people have gone and visited our labs, and see that as the best practice. Stengel: Harold Ford I see you have a question. Prahalad: Can I just add to it. Also, in full disclosure, I am on the Microsoft-India advisory board. So, I know this experiment, and I have gone to the labs a number of times. The thing that I find fascinating is it's all done by less than 10 very bright people. It's not thousands of people, just 10 kids. You let them loose, and the produce something extraordinary. So, I think, this is not about resource allocation, because everyone assumes they have to have massive shifts of resources. No. You have to shift your mind, and then suddenly marginal changes in resource allocation can produce disproportionate benefits at the bottom of the pyramid. That, I think, is the lesson that companies have to learn to accept. Harold Ford: Tennessee, Alabama, and Mississippi, a recent study showed to be the three most obese states in the country. I'm fascinated by the interplay by the government in the private sector and the role that it plays in addressing serious issues. You talk about economic freedom, and I would imagine a choice and availability of options would have to be considered part of that freedom, you live in communities where the options to eat healthier, to afford healthier foods, the price points might not be there. How do you balance it out? I appreciate your points about government in a lot of ways being in the way of advancement on so many fronts, but as someone who was in government for a little while, I struggle with this as well to try to find the appropriate balance. Mackey: So do you think we have to arrest all the fat people, or what? Ford: By no means, I am saying perhaps, how can government play in the private sector play a smarter, more efficient role for people who simply can't afford, and you may have a particular interest, because this is part of what you do. But how is it when you live in a community where the median income is 20,000 dollars or less, that you can access the healthier foods. Of course a Whole Foods might not be, I don't blame the private sector, but I'm trying to figure how do you balance this out and do it in a way where you can achieve the goal of making communities healthier and how to impact the health costs. Mackey: Well if that question is to me, I'll take it. Mackey: Well, first of all, there's not a widespread perception that how much food prices have gone down in the last 100 years you often times need to look at poverty in a historical treadline context and look at price of food. I mean we spent about 60% of our disposable income on food a hundred years ago, and we now spend about 8% in the United States. America has the interesting paradox that our poor people are fat, and the poor people in other nations are thin, because cheap calories are readily available in American society. But it would take us pretty far a field if we were to discuss the, I don't think the American people get the honest truth about what health and nutrition is. And I think the government is heavily involved in that, due to the way its regulated and due to the power that a lot of the big food companies have in terms of capturing those regulators, so the truth about healthy food and healthy diet is not readily available in America. But that's a little bit off our topic and perhaps I don't want that on CNN, so I'll have a conversation off the record with you. Ed McCarrick: Oh, that's perfectly ok. Just a quick question, because I do sit on a board concerned worldwide that is all about empowering women in third world countries and so forth. But the question to me is, and we are part of this Rick, you and me, and maybe this is a question to you and everybody else can make a comment, so I don't put you on the spot, does media do the right job in terms of talking about what these companies are doing? Because I know that sometimes, and I'm not criticizing here, you know, we'll put on the cover of Time, you know, 'Why You're Prescription Drugs Cost Too Much Money,' and then I've got the CMO and CEO of a company blistering me all week on the phone, but is there the opportunity there for us and is there the responsibility, because I know when Mr. Luce and Mr. Hadden founded this brand name they viewed it in the public trust. For us to go forward, since we are a global brand, CNN is a global brand, can we do more? Ok, could we start a Time 100 on corporate social responsibility, ok that we could do on an annual basis and use our Time 100 as part of this process, and make it a much bigger educational process for the fact that we touch 30 million consumers in one week, and we're touching a 100 million online every month and so forth. Is there an opportunity there for us, and I'd be interested in terms of what the esteemed panel thinks about that as part of the process? McCarrick: The media in general, not TIME in particular. But we'd love you to say something about TIME. But is there an opportunity there for us? Gates: Well I think media in general does view its mission as much broader than profitability. And in fact that's creating this dilemma nowadays when the profitability piece at least in the newspaper sector, but all to a lesser degree, is under such attack, where society as a whole values what media does beyond just its economic return. The media has over time highlighted very important causes. I do think there is an opportunity to take this idea of how corporations are participating with their innovation power to help the poorest and highlight good practices. It will probably have to be done industry by industry. It is very hard to compare across industries so you'd want to reach out to somebody who has the expertise to look at the food companies or the cell phone companies and give you a clear sense of what's being done there. But yes, any movement like this benefits from the visibility of the best practices and in some cases the worst practices. Mackey: I wish the media would ask the question. What is its purpose? Why do you exist? Because increasingly my experience with the media is, I would think its purpose is to shine a light of truth, and that's what it should be about. And I think that inspires young journalists to come in and they want to reveal the truth to people. But often times my experience with the media is not that at all. The media is trying to sell a story, and the story doesn't always correlate with what is true and accurate. So I would love for the media to examine itself and ask itself why does it exist, and what's its purpose in the world. And perhaps that might be a good self-examination. Lazarus: I think the media can play a huge role, and I think what we're talking about right here is trying to create a movement, create movements and to be able to have the power of the media to get the word out, because not only does it then bring the world, the public together in it, but it helps all the people who are doing good things, it encourages them, I think, to do more. Because the world applauds once they know. So, I think it rewards good behavior too. Prahalad: I think the fact that you would organize this panel itself is quite interesting. Because I think media, especially all of your brands, have a lot of authority. And I don't think they've used their authority well in building role models, and socially legitimizing certain kinds of behavior. If we can legitimize socially that large companies can do good things for the world then that should be part of their mission, not some add-on, then I think more and more people are likely to do it. I think there's also a social legitimacy that you want to create, and I think the media has a huge role to play. This movement will not go forward if the media stands by and does not play its part. So, in other words, I feel very strongly that the media must do it. All the stories from the poor countries need not be only stories of poverty and corruption. There are lots of people doing very very creative work, and I think we want to highlight their achievements in spite of all impediments. I just said don't look at the swamp, look at the lotus. Because there is a huge difference. There are good things that are happening. Gupta: The lotus in the story about women, that I'd like to see the media portray better is that women are producers not just consumers. Women are not just victims, they are agents of change. That's the story that doesn't get told, has baffled me. Women are economic producers, and we have plenty of evidence to show that, and they're an untapped source and they have enormous potential. They could create a ripple effect to even stop the inter-generational transmission of poverty if we do it right, and that's a story that hasn't been told that well and hasn't been made as visible as it should be, and I have all the evidence to support that argument. Prahalad: And I'll even go one step further. She knows my views on this. I would just say, having a gender bias is critical for development. In the US, we don't like gender bias, we want gender equality. I say in poor countries, gender bias is not a bad thing. Gupta: You have to clarify towards women! Prahalad: ... towards women! Of course, she knows my bias. Because I believe, I've said this many times, an educated woman is an educated family, an educated man is not necessarily an educated family. And I think that's the truth in most parts of this world, and so I think it's very important for us, and I think for the media to show the very powerful role of women and power women play. And even in places where stereotypes will not allow us to think that way, mostly women can not be independent, going back to Bangladesh, I can highlight the fact that in an Islamic country women are capable of taking charge if you give them a small chance. So, I think its important to challenge those assumptions. Stengel: I think a discussion of media is a great place to end our fantastic and enlightening discussion today. I would only say that the fact that we are doing this panel today. The fact that we are doing this story by Bill, we have an incredible platform and megaphone for these ideas, and these ideas will be going out to millions of people next week when we do this. So, I want to, and women is a good subject to end on, because of our educated chairman, Ann Moore, who is here too. So, on behalf of my partner, Ed McCarrick and Anne, thank you, in particular, Bill, for really putting this all together and thank the panelist for contributing to this. It was a really terrific discussion. Thank you! Thank you all for coming.